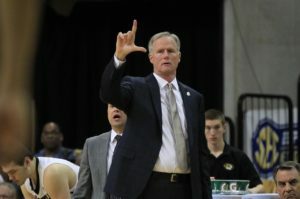 Jordan Barnett tied a career-high 23 points and grabbed nine rebounds as Mizzou men’s basketball gave Kim Anderson his 300th career coaching win as the Tigers beat Vanderbilt 72-52 Saturday afternoon at Mizzou Arena. Anderson said it took much too long in his time at Mizzou to get to 300. “It’s been tough, it’s been a tough three years. I’m not gonna try to tell you it’s been the time of my life,” said Anderson discussing his milestone. One game after Barnett set his career high in their Wednesday night loss at A & M, Barnett followed it up with another big time performance. The two statistical categories Vandy was supposed to dominant in against the Tigers were three-point shooting and rebounding. Mizzou dominated and they went hand in hand in this lopsided victory. The Commodores shot just 6-of-28 from three point range and 7-footer Luke Kornet was held to just 11 points and went 0-for-9 from deep. Vandy came in leading the SEC in that category. 22 missed shots from long range meant a lot of long rebounds and the Tigers scooped up most of them outrebounding Vandy on their end of the floor 27-6. The Tigers held a total 43-25 rebounding advantage. Meanwhile, the Tigers were 9-of-19, a 47% clip from three point range. Kevin Puryear had 13 points (3-for-3 on three’s) and eight rebounds, and Russell Woods added 10 points and five rebounds.